You won’t want to miss Community Care’s Thrift Shop half price clothing, shoes and boots sale. The sale continues through the month of April. “Like” the Thrift Shop Facebook page so you don’t miss out on sales and promotions. Shop…donate…volunteer. 100 per cent of the proceeds help County seniors live at home. For more information call the Thrift Shop, 153 Main Street in Picton, at 613-476-1555. Chair exercise starts today. This gentle exercise class for seniors 60-plus is designed to help improve mobility, flexibility, and strengthen muscles. Certified instructor Penny McRae leads this 10-week exercise class on Thursdays at the Picton Town Hall. Call 613-476-7493 for details. Therapeutic touch is a gentle holistic, evidence-based energy-based healing therapy. This is an excellent program for all health care providers, caregivers and interested individuals. 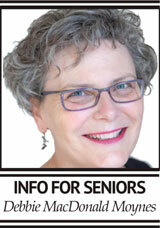 This workshop is offered by the County Seniors Centre in Picton and taught by Alison Cooke. It is two full days from 9 a.m. to 4 p.m with the first session on Monday, April 15, and the second full-day session on Wednesday, April 17. Registration is open to all. County Seniors Centre members $99, non-members $110. To register call 613-476-7493. We decided to try using the title “Lunch and Learn for Seniors” to see if it’s more descriptive than “Seniors Luncheon Social”. Let us know what you think about this different name for the program by emailing info@communitycareforseniors.org . Seniors 60-plus are invited to enjoy good food and conversation with old and new friends on Wednesday, April 17 at the Milford Town Hall or April 24 at the Wellington United Church. Both events are at noon. The menu features roast beef, potato, vegetable, strawberry shortcake, bread and butter, coffee or tea and catered by Wheel House and Occasions Catering. The cost is $10 per person. The learning portion in Milford includes a presentation by Ed and Sharon from Kelly’s Home Health on mobility devices; and in Wellington we’ll have Medigas talk about mobility products and devices. Reserve by the Tuesday prior at 12 noon, 613-476-7493. Take-out & delivery available. Interested in Ham Radios? Attend an interesting presentation April 18 at Picton Town Hall. “Maracas and Claves and Djembes. Oh my!” This is a terrific one-hour interactive event on Wednesday, April 24 at Bloomfield Town Hall. Quilting for Fun will be held on Thursday, April 25 at Sophiasburgh Town Hall. The Canadian Hearing Society will be at the Hillier Town Hall holding a Hearing Help Clinic on Friday, April 26. Call Community Care to book a confidential appointment or for more information at 613-476-7493. Calling all seniors to “Learn to Play the Piano by Ear” with Don Hinde. This fantastic opportunity is yours on Monday, April 29 or Monday, May . You need to sign up by calling 613-476-7493. Mark your calendar for the “Mobility Workshop & Medical Scooter Rodeo” that’s on for June 6.